You may wonder why, after making a set of pjs recently (at the end of the post) I am making another set so quickly. I usually only have one set on the go... we have sunshine year round and it can sometimes take only minutes for them to dry and with so many things I want to sew, I usually make them out of need. Anyway, if you notice on the other set, I had made them out of a remnant of a dress I had made years ago. I had enough fabric because I cut the top on the cross grain. Now I learned at TAFE for Fashion Design and Apparel Production that I did vocationally in the '90's that natural fibres possibly only woven, will shrink up... meaning in the length, not the width. I had pre-washed this fabric years ago, but when I made these last pjs, after a few washed, the fabric shrunk but being cut on the cross, they shrunk width wise. They still fit well, but being SO hot at night, they are just too close to my body. Plus they were a shirting cotton weight and I usually like something more voile weight, hence the new pjs. 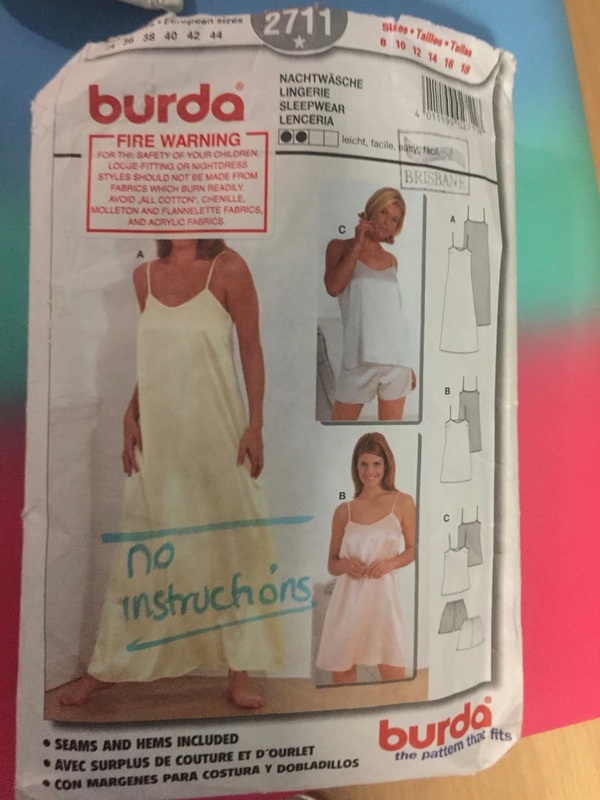 Using the workhorse Burda 2711 pattern. On a side note, anyone used this little bobble things? I tried putting them on that pair of shorts for my friend, but I just could not get the bobbles to stay in one place and would run all over them. I gave up, but today I tried again. First go I though "what if I zig zag over them".. no, it was ok but looked sloppy (again - buy me dinner if you are getting that close! ), but I would know and it would bug me. Then I looked into the Bernina feet I got with this machine and tested the No 5 foot... didn't even look up what it is, I just ran the little guide into the edge of the bobble, and guided it through ... YAY! I was thrilled as I bought a few colours of this up the coast a couple of years ago and was disappointed when I couldn't sew them on well. See how it just sits next to the bobble and I had to get my needle one stop to the left of centre, and I just eased it through. So glad. Ok so these are the pjs. 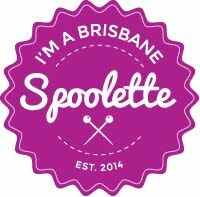 Any Spoolette recognise the fabric? I picked it up at one of the High Teas, maybe 2 years ago. I immediately knew it would become pjs, but with the last set, I was on my remnant kick so this didn't get a look in. It's a lovely Japanese cotton lawn (? voile?) and it's lovely and soft but I felt the monochrome needed a little lift. I would have put it around the leg hems but I'm short about 10cm; isn't that always the way. I'll be wearing these tonight! Close up of the bobbles. I did a double deep hem and put the bobbles over the seam. Random overlocker thread. I overlocked in black because that's what was in the machine. Made my own bias. I can't find my bias making tooly things so I just folded it myself and ironed down. I made it about 4cm wide to get a wider strap. Nothing to say re the shorts; they're pretty basic but do the job and are a quick sew. Great job. The bobble trim looks very effective against the black and white circles. Thanks for the warning about cutting fabric on the cross grain. I have done this before but had never considered the potential problems of shrinkage affecting the width. Personally I can't wait for summer to be over but thank goodness the 43 degree day only lasted for the day. Your PJs are darling! I love the bobble you added, and think it is great that you already had the tool you needed. I also like PJS that keep me cooler and less constricted. Very nice work. Love your new PJs, beautifully sewn as always. I am a sucker for bobble trim but have not tried that little cute one - now we know how to sew it on nicely. Well done!